A MONTPELIER school has seen an increase in the uptake of lunch meals since becoming a part of a scheme that encourages pupils to live a healthier lifestyle. 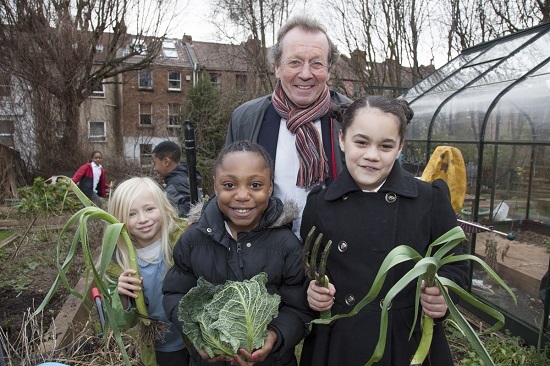 St Barnabas Primary School joined the new awards scheme, launched by Bristol mayor, George Ferguson, in a bid to help students understand how to improve their health. Up to sixty schools have already shown an interest in working towards the 'Bristol Mayor’s Award for Excellence as a Health Improving School'. St Barnabas has transformed the way school meals are presented and pupils are growing their own food, contributing to changes in school lunch contents and gaining a greater awareness of the need for a healthy lifestyle. Jilly Pridmore, headteacher at the school, said: "We are proud to be a Bristol healthy school and we are convinced by the benefits to pupils both in and out of the classroom. "Mealtimes have been transformed; we now have plates not trays, table cloths, menus on the table, a lunchtime raffle and the most popular - a salad bar. School lunches have never been so exciting. Ms Pridmore added: "We have seen an increase in the uptake of school meals and more importantly we have seen a significant increase in the number of children eating their school meal. Packed lunches have got healthier too." As well as teaching children about healthy eating and how to grow and cook food, schools are also helping pupils to understand the importance of physical activity, personal safety, building positive relationships with people in their lives and talking about their worries and anxieties. Mayor George Ferguson said: "Bristol has a growing child population and one of our biggest challenges is addressing their needs. "Lifestyle and habits formed in childhood can influence a person’s health throughout their life so I’m delighted to announce this new award scheme for schools to help our children learn how to live healthy, fulfilled lives." Successful schools will be recognised at a special awards celebration in July 2014.